In advanced state of ripening after the noble rots have completely wrapped around the clusters. It is a wine of remarkable structure and elegance, soft, wrapping, extremely pleasant, with distinctive aromatic notes. 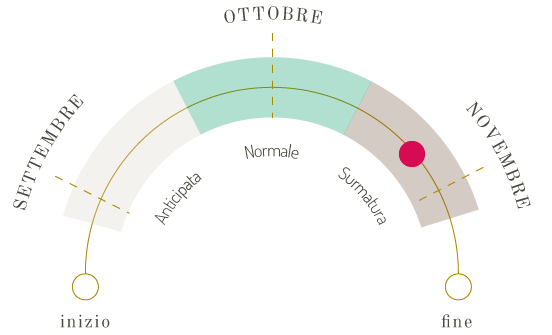 Cimaio is produced in the inland of central Le Marche, in the company-owned vineyards. The soil is of a medium to loose consistency, with a southeast exposure. Grapes, completely attached to their noble rot, are harvested in advanced state of ripening. The wine is obtained with the technique of “fermentation in white”: the “vinification” process occurs half in small wooden barrels and half in steel tanks. The refining process takes six months in steel and wood tanks, then another six months in steel tanks and finally 12 to 18 months in bottles. Colour: Yellow with golden reflections. Perfume: It exudes sweet scents of vanilla followed by mature notes of quince, honey, almond and spiced nuances. Flavour: In the mouth, it emerges its full body structure. On the nose, fruit notes prevail. Mineral, slightly bitter, but rounded, soft, warm and savoury – very persistent. Meditation wine, excellent with very mature and dried cheeses, or with very savoury and determined dishes, like first courses with cheese, fish soup, codfish, liver and fois gras. Grapes, entirely attached to their “noble rot”, are harvested in advanced state of ripening (end of November, beginning of December), when all the clusters have been wrapped in noble rot (botrytis cinerea). Wines produced with this type of late harvest will be highly structured and enhanced in their softness and amiability.